Photographer Alec Malone does not follow his long-term Senator-father into politics and turns down the “opportunity” to be a war photographer in Vietnam. Is this something he will live to regret? Alec’s Swiss-Czech wife Lucia isn’t sure Washington is the place for her. She takes comfort and finds intellectual stimulation in the company of her Eastern European emigre neighbors and their frequent garden parties (literally exiles in the garden). Will this be enough for her? Alec’s 90-something Senator-father is beginning his final decline. Will Alec get closure? Lucia has never me her long-dead father. Will Lucia get closure? 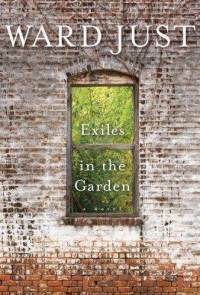 But Exiles in the Garden is little to do with U.S. domestic politics and much more to do with the alienation and displacement, and international and intranational conflict and violence. But it is also about Alec’s quest for…hmm for what? There is something about this book that makes it difficulty for me to see the connection between Alec’s issues and the whole exile angle. Perhaps there is not meant to be that much of a connection. But then to me it just feels a bit episodic. I thoroughly enjoyed the episodes, Ward Just is a wonderful author**, but I didn’t quite get how it was all supposed to hang together. For anyone interested in the world of old-school politics and its air of noble expedience and corruption you really can’t go wrong with Ward Just. I just wouldn’t start with this one. *On a little side note–although it is related– I need to rant for one second. Back in the 2008 presidential elections Sarah Palin often made comments about how she would bring more small town America to Washington. She often used comments like these to bait her base by taking a poke at the East Coast, politicians, and intellectuals. (Amazing how politicians like to act like they aren’t politicians.) My thought then, and my thought now, is that Congress has hundreds of members from small towns across America. In fact Congress is nothing if not dripping with small town baseball, mom, apple pie, etc. I think that part of the problem in Congress and Washington in general is that too much time, effort, and legislation goes into protecting, not small town values (hard work, honesty, etc. ), but rather those less noble parochial concerns that may be good for a specific Congressional district but aren’t good for the country as a whole. **A former journalist with the Washington Post, Just is usually pretty accurate with his details, but I ran into a few that made me wonder if he is slacking off a bit these days. The first thing that made me wonder was that he wrote about tour buses at the Treasury building. This doesn’t ring true unless they did make stops there at one time or it was to drop folks off for the nearby White House. But you just don’t hear about or see tourists making a beeline for the Treasury. The Bureau of Engraving at the other end of 14th Street, maybe. But Treasury? Still, I was able to over look this. There may be something I don’t know. But then he writes about a character’s radical parents who live on the Iron Range in northern Minnesota who “were forever plotting the overthrow of the government in Minneapolis…” You don’t have to be a Minnesotan to know that the seat of the state government is in St. Paul, not Minneapolis. And someone as poltically astute as Just should know that unless you are talking about municipal policy, Minneapolis is about business not politics. It seems like a small point, but such a basic mistake kind of makes one wonder what else he might be getting wrong. This is not something I expect from Just. I agree with you wholeheartedly about Congress. They lose sight of long-term planning and, as you say, what's best / good for the whole country. Instead, they waste taxpayer dollars on roads to nowhere that provide jobs to their districts for a year or two but that aren't of any benefit to the rest of us, or even the people who live there and don't need that road. And most of are better at budgets than they apparently are. Wouldn't it be nice if we could all just raise our debt ceilings (even if our credit cards are at the max) and just demand more money of our employers? Congress and the president are the ones who can't live like real people.